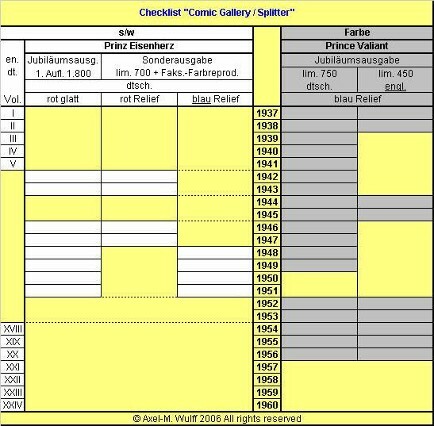 Splitter Verlag did publish several comic book series in a confusing order. Many thanks to Mr Axel Wulff for helping me out in the only correct and final line up below. Serie 1: Dell sonderausgabe comic book series. German language. Serie 2: Red/Pink edition ' Jubilaums ausgabe". Smooth cover surface. B&W. German language. 1800 prints only.Title: Prinz Eisenherz. Serie 3: Red/Pink edition 'Sonder ausgabe". Relief cover surface. B&W. German language. 700 prints only.Title: Prinz Eisenherz. Serie 4: Blue edition 'Sonder ausgabe". Relief cover surface. B&W. German language. 700 prints only.Title: Prinz Eisenherz. Serie 5: Blue edition 'Jubilaums ausgabe". Relief cover surface. Color. German language. 750 prints only.Title: Prince Valiant. Serie 6: Blue edition 'Jubilaums ausgabe". Relief cover surface. Color. English language. 450 prints only. Title: Prince Valiant. Serie 1: Dell sonderausgabe comic book series. German language.Consists of 7 books. Light Blue covers. In the US there was also a Dell comic book serie (see the seperate Chapter). These comics are made by Henry Hathaway and art by Bob Fujitani. Based on the 1954 movie . This has nothing to do with Hal Foster! Splitter Verlag did bring this serie to Germany and reprinted it. The books are printed in softcover (serie 1a) and hardcovers (serie 1b). From the hardcover serie only 500 copies of each books are made (these are numbered). The covers are the same, so I show the pictures only once. Valua around EURO 20 each. Printed in 1992. This serie consists of 8 books with the following titles: 1942, 1943, 1946,1947,1948,1949,1950,1951. Big books, A3 format. Expensive books; around Euro 60 each. Printed in 1992. This serie consists of 4 books with the following titles: 1942, 1943, 1946,1947. Big books, A3 format. Expensive books; around Euro 60 each. Printed in 1992. This serie consists of 4 books with the following titles: 1948,1949,1950,1951. Big books, A3 format. Expensive books; around Euro 60 each. This serie consists of 18 books. All books between 1937 till 1956 are printed EXCEPT the years 1950 & 1951. Big books, A3 format. Expensive books; around Euro 60 each. The differences between this serie and serie 6 can't be seen on the front cover. This serie consists of 9 books with the following titles: 1937,1938, 1944,1945, 1952,1953,1954,1955,1956 Big books, A3 format. Expensive books; around Euro 60 each. The differences between this serie and serie 5 can't be seen on the front cover. Serie 2; Red/Pink edition ' Jubilaums ausgabe". Smooth cover surface. B&W. German language. 1800 prints only.Title: Prinz Eisenherz . Serie 4; Blue edition 'Sonder ausgabe". Relief cover surface. B&W. German language. 700 prints only.Title: Prinz Eisenherz. Serie 5; Blue edition 'Jubilaums ausgabe". Relief cover surface. Color. German language. 750 prints only.Title: Prince Valiant.